Somewhere on the road to zero waste, I became a bit of a hoarder. I don’t mean a hoarder of garbage, I just meant that I don’t throw things out if I think they “might” be useful, and I definitely don’t throw them out if they’re in perfectly good condition. Take, for example, my slippers. I have 5 of them. All in very good condition. All very cozy and comfortable. Some high cut, some low cut, some hand knitted, some store bought, some with padded soles, some not. The thing is that I don’t have a single matching pair. And I can’t throw them out because they are perfectly good slippers. And I can’t donate them to charity, because who’s going to buy a single slipper at a thrift store? So I’m stuck wearing random pairs of slippers, refusing to get rid of any of the 5 lest its partner show up (it has been known to happen). It gets worse. This problem extends to socks too. I have a bag of over 50 mismatched socks. Good socks. $15 smart wool socks, and ski socks, and socks that still have lots of life left in them of only they could find a mate. Before you interrupt, yes, occasionally I wear mismatched socks. In fact, those who knew me when I was a kid know that for about 12 years, I exclusively wore mismatched socks (but that’s another story altogether. And those socks weren’t mismatched, they were the same socks, just in different colours), but at the office, mismatched socks don’t cut it. And, call me a princess, but I just like the feeling of wearing two matching items on my feet. I don’t have the answer here; I think I’m just realizing that it’s hard to “minimize” and “live simply” when you can’t get rid of something as simple as a slipper. . . . . anyone else have a bag of orphan socks laying around? I swear the washer eats socks. When raising my kids (5) we had a laundry basket full of orphan socks! A fun saturday nite was dumping it out and all the kids competing to see if they could find any matches (or even close matches). Sometimes the other sock would find its way to its mate. 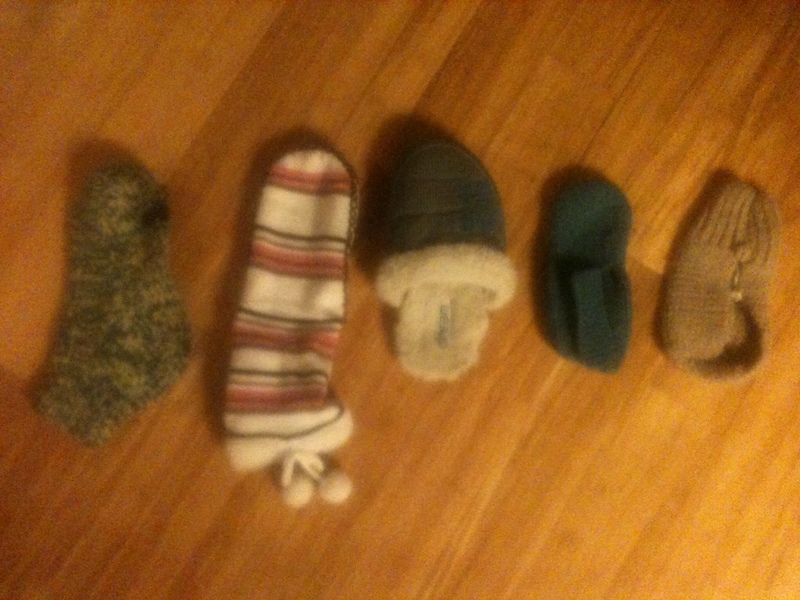 A match made in heaven…..
surely if we re-unite all the slippers and socks in the world with no partners we could find some mates. The odds are not in our favour … but nothing is too good for the global effort. I feel your pain. I can’t help you *now* but I can tell you what I did to minimize this in the future. I bought all my socks the same. I have one set of summer socks (white, cotton, anklets) and one set of winter socks (SmartWool black knee-high) and one set for spring/fall (Smartwool, thin, grey, and above the ankle). That way, when I lose one, it’s no big deal. It matches all the others. Are any of the slippers or socks 100 percent wool or 100 percent cotton? If that’s the case, and I was convinced its partner was never going to show up (because, for example, I used that sock for a crafty project), I’d compost them. Or cut them up and use them as rags, and then compost the scraps. In fact, most of my single socks end up in the craft bin, now that I think about it. Well this comment isn’t nearly as much help as I’d thought. Good tip Christine. Most of my socks are elastic-y even when they say wool, but maybe the wool would just degrade and I could pick the elastic out of the compost later. I too have trouble with the stuff that might still be useful but I can’t give away. Our single socks live in the Lonely Sock Box in my closet. Happy reunions do occur quite regularly, especially after my kids clean out under their beds. If a sock has been in their for a long, long time, I try to find another use for it. Some I fill with cedar chips and put in drawers and closets to ward off moths. Others get cut into rags or chopped up and used to stuff draft stoppers for our drafty doors. I do end up with more single socks than I can use, though. Oh… I have such major sock issues. I just feel so guilty throwing them away, even when they are threadbare, full of holes and darned beyond all hope of darning. It just seems like such a waste when 90% of the sock is still perfectly functional, it’s just the part that you walk on that’s worn out. But, I finally decided that I had to deal with my sock problem this year, so I went through the sock drawer and pulled out a grocery sack full of socks that were beyond wearing… either they had too many holes, or were completely threadbare, or the elastic was shot. I couldn’t bring myself to toss them though, so they’re now in the rag bag. Anyone know where you can send fabric in the city to be “recycled” into rags? I used to know one, but their warehouse got filled up in a matter of weeks and they had to stop taking donations. Your best bet is craigslist I think. Or freecycle. When we used to share the washer and dryer with our landlords this single sock problem became complicated. We used to have an annual “Sockholders” meeting to sort them all out. This won’t help you with single slippers, but now I always buy at least two (often three) pairs of socks the same so if one gets lost at least there are three remaining, then two to continue the pair. This also works if they wear out and don’t actually get lost. BTW, my Dad (as featured in the clean bin movie because he used the same shaver all his life) always purchased the same type of socks from age 14 until death. A specific make, high-top elasticated mid grey. We tried giving him charcoal grey or even dark grey occasionally, but no, he insisted on mid-grey for 75 years. He was never without a pair. Long Sock: Cut sock in half + sew one end of the top half = two matching pairs. If sew as poorly as I do, the one you sew doesn’t last as long as the other. If the socks are large enough, such as Grant’s sport or hiking socks, fill about two-thirds full of cheap dry beans or corn (not popping type) sew up the opening, heat in microwave for a minute and use as hot neck pad.Wonderful for these cold days when you’ve overworked the neck muscles in the gym. You can use fabric scraps to make square hot pads for your back or to warm the bed at night. We use these all the time now. I remember that my grandmother used to make pillows and stuff them with nylons that were worn out – very cushy. Betchya that works with socks and soft slippers, too! Maybe remake the slippers into something else? Like mix-matched mittens? 1. Consider the socks as “batting” material for a quilt. There are local quilting clubs that may like having your old socks, t-shirts, or slippers. 2. Make sock pupppets for young children. Find an attractive button for the eyes, and do some decorative top-stiching and voila! Sock puppet! 4. Re-purpose. Take the slippers that are knit and unravel them to the basic yarn that they come from. That nice yarn can be turned into a new project in the future. What about “Our Social Fabric” who takes random pieces and re-works them… I’m not sure though, I have this exact issue, too…haha your post made me laugh…I often wonder where the line between hoarder and enviro is drawn… I think it’s all about your reason for keeping it…and so, I go with enviro…would be nice though to have a place for everything to go…. I saw wool dryer balls at this store, that are supposed to absorb moisture and help dry items faster – perhaps you can make one (or some) of your wool socks into a dryer-ball type thing? I can relate. I’m finding that there’s a very fine line between “urban farmer” and “hoarder.” When you’re growing on land that is $7million an acre, you just can’t afford to throw anything out that you might be able to use again…. seed trays, clamshell containers, egg cartons, bags of every shape and size, boxes….. And you just can’t pass up any awesome free craigslist item (like 200 brand new buckets for example that would be GREAT for making sauerkraut in, or brining turkeys or……..). Losing one slipper is understandable and human – even Cinderella-like. Two is acceptable. There is somewhat careless. Four is rather alarming and disappointing. But five is outrageous. No way can you lose five. BTW have you checked with Gatto? If you have some orphaned handmade slippers, why not make them a matching slipper? Find similar yarn and a similar pattern and voila, you will have an almost-matching set! Good one! I can definitely make a match for the knitted ones. As an update, I ended up finding ANOTHER set of slippers that do match, so I’ve been wearing those. oh gosh, I can relate to this too!! As for slippers – hm? Some good ideas out there already.. You could also re-use the pretty ones as ‘decorative items’, holders for dry flowers or combs or such (?) or Santa’s socks or such? I think it is still a good idea to keep your single slippers and socks even though they are mismatched. Anyway it doesn’t matter if they are matched or not when you’re around the house! And holding onto them reduces garbage and the other pair to the sock/slipper might turn up somewhere. Thanks for the advice. I actually still have the bag of mis-matched socks, so I will start wearing them indoors and when I wear boots. slippers are usually for around the house so it doesnt matter. Socks are everyday wears and anyways you wear them under shoes so nobody will see if they are mixed n matched! I agree with the slippers. I usually wear socks to bed, so I’m ok to wear my mismatched socks for that. Any of the 100% cotton or 100% wool make excellent dish scrubbers. The wool will be slightly more abrasive, but works well on most pans without scratching them.